The kids love it, we love it, it's cheap, it's easy -- the question is, why don't we do it more often? I suspect, as with most things these days, it's about making the time. Yet walking or biking to school is a great example of how sustainable travel can improve your quality of life. Instead of jumping in the car for the ride to school or even that short trip to the store, or library, consider getting there sustainably -- without using your own gas and creating more pollution. With Earth Day coming up, here are five benefits of sustainable travel to get you thinking about choosing alternative modes of transport. Improves your health - walking or biking even short distances helps you stay in better shape and decrease your risk of getting sick. Statistics show that when you're more active, you decrease your risk for cancer, heart disease, obesity and diabetes. You can include your workout as part of your daily activity, which not only ensures that workout happens but helps you meet your fitness goals. Better for the environment - choosing a greener form of transportation helps lower greenhouse gas emissions and reduce pollution. Makes you happier - exercise and fresh air gives you more energy throughout the day and positively impact your health and happiness. Your focus shifts to your surroundings -- the blossoming trees, the birds tweeting, thereby increasing your awareness of the link between you and your environment, your community. I think some fresh air is a great way for kids to clear their heads and start the day fresh -- and ready to learn. Improves your relationships - choosing a slower mode of transport allows you to enjoy a shared experience with whomever you're traveling. Walking, in particular, provides a great opportunity to chat to your child about their day, what's happening at school, etc. Saves you money - power yourself and you save money on gas bills, on car maintenance, on parking costs. Do you really want to be stuck in a traffic jam like this at pick up and drop off? We're lucky we're just a few blocks from school and can walk. Unfortunately, more often than not, it seems we don't -- but we are trying. When the weather's nice, walking is a must, as are 'Walk to School Wednesdays'. We've also set up a 'walking school bus' with a neighbour so they come by and walk our kids to school one day a week and we take theirs one a day week. 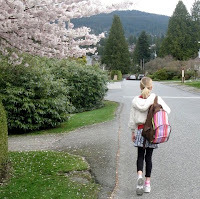 It's amazing how, with just a little effort and planning, walking to school can resemble a habit -- becoming something you actually miss when you don't do it. Now we just have to work on walking home. For more information about sustainable travel, visit TravelSmart.ca. Learn about non-toxic and eco-friendly alternatives for greener living at our eco boutique Lavish & Lime. If you have any thoughts about sustainable travel or more specifically, walking to school, please leave a comment below. We'd love to hear from you!